This article is about sets of letters used in written languages. For other uses, see Alphabet (disambiguation) and Alphabetical (disambiguation). An alphabet is a standard set of letters (basic written symbols or graphemes) that represent the phonemes (basic significant sounds) of any spoken language it is used to write. This is in contrast to other types of writing systems, such as syllabaries (in which each character represents a syllable) and logographic systems (in which each character represents a word, morpheme, or semantic unit). The first fully phonemic script, the Proto-Canaanite script, later known as the Phoenician alphabet, is considered to be the first alphabet, and is the ancestor of most modern alphabets, including Arabic, Greek, Latin, Cyrillic, Hebrew, and possibly Brahmic. Peter T. Daniels, however, distinguishes an abugida or alphasyllabary, a set of graphemes that represent consonantal base letters which diacritics modify to represent vowels (as in Devanagari and other South Asian scripts), an abjad, in which letters predominantly or exclusively represent consonants (as in the original Phoenician, Hebrew or Arabic), and an "alphabet", a set of graphemes that represent both vowels and consonants. In this narrow sense of the word the first "true" alphabet was the Greek alphabet, which was developed on the basis of the earlier Phoenician alphabet. Of the dozens of alphabets in use today, the most popular is the Latin alphabet, which was derived from the Greek, and which many languages modify by adding letters formed using diacritical marks. While most alphabets have letters composed of lines (linear writing), there are also exceptions such as the alphabets used in Braille. The Khmer alphabet (for Cambodian) is the longest, with 74 letters. Alphabets are usually associated with a standard ordering of letters. This makes them useful for purposes of collation, specifically by allowing words to be sorted in alphabetical order. It also means that their letters can be used as an alternative method of "numbering" ordered items, in such contexts as numbered lists and number placements. The English word alphabet came into Middle English from the Late Latin word alphabetum, which in turn originated in the Greek ἀλφάβητος (alphabētos). The Greek word was made from the first two letters, alpha(α) and beta(β). The names for the Greek letters came from the first two letters of the Phoenician alphabet; aleph, which also meant ox, and bet, which also meant house. Sometimes, like in the alphabet song in English, the term "ABCs" is used instead of the word "alphabet" (Now I know my ABCs...). "Knowing one's ABCs", in general, can be used as a metaphor for knowing the basics about anything. 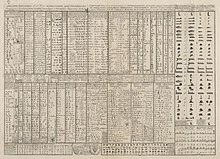 The history of the alphabet started in ancient Egypt. Egyptian writing had a set of some 24 hieroglyphs that are called uniliterals, to represent syllables that begin with a single consonant of their language, plus a vowel (or no vowel) to be supplied by the native speaker. These glyphs were used as pronunciation guides for logograms, to write grammatical inflections, and, later, to transcribe loan words and foreign names. In the Middle Bronze Age, an apparently "alphabetic" system known as the Proto-Sinaitic script appears in Egyptian turquoise mines in the Sinai peninsula dated to circa the 15th century BC, apparently left by Canaanite workers. In 1999, John and Deborah Darnell discovered an even earlier version of this first alphabet at Wadi el-Hol dated to circa 1800 BC and showing evidence of having been adapted from specific forms of Egyptian hieroglyphs that could be dated to circa 2000 BC, strongly suggesting that the first alphabet had been developed about that time. Based on letter appearances and names, it is believed to be based on Egyptian hieroglyphs. This script had no characters representing vowels, although originally it probably was a syllabary, but unneeded symbols were discarded. An alphabetic cuneiform script with 30 signs including three that indicate the following vowel was invented in Ugarit before the 15th century BC. This script was not used after the destruction of Ugarit. The Proto-Sinaitic script eventually developed into the Phoenician alphabet, which is conventionally called "Proto-Canaanite" before ca. 1050 BC. The oldest text in Phoenician script is an inscription on the sarcophagus of King Ahiram. This script is the parent script of all western alphabets. By the tenth century, two other forms can be distinguished, namely Canaanite and Aramaic. The Aramaic gave rise to the Hebrew script. The South Arabian alphabet, a sister script to the Phoenician alphabet, is the script from which the Ge'ez alphabet (an abugida) is descended. Vowelless alphabets, which are not true alphabets, are called abjads, currently exemplified in scripts including Arabic, Hebrew, and Syriac. The omission of vowels was not always a satisfactory solution and some "weak" consonants are sometimes used to indicate the vowel quality of a syllable (matres lectionis). These letters have a dual function since they are also used as pure consonants. The Proto-Sinaitic or Proto-Canaanite script and the Ugaritic script were the first scripts with a limited number of signs, in contrast to the other widely used writing systems at the time, Cuneiform, Egyptian hieroglyphs, and Linear B. The Phoenician script was probably the first phonemic script and it contained only about two dozen distinct letters, making it a script simple enough for common traders to learn. Another advantage of Phoenician was that it could be used to write down many different languages, since it recorded words phonemically. The script was spread by the Phoenicians across the Mediterranean. In Greece, the script was modified to add vowels, giving rise to the ancestor of all alphabets in the West. The vowels have independent letter forms separate from those of consonants; therefore it was the first true alphabet. The Greeks chose letters representing sounds that did not exist in Greek to represent vowels. Vowels are significant in the Greek language, and the syllabical Linear B script that was used by the Mycenaean Greeks from the 16th century BC had 87 symbols, including 5 vowels. In its early years, there were many variants of the Greek alphabet, a situation that caused many different alphabets to evolve from it. The Greek alphabet, in its Euboean form, was carried over by Greek colonists to the Italian peninsula, where it gave rise to a variety of alphabets used to write the Italic languages. One of these became the Latin alphabet, which was spread across Europe as the Romans expanded their empire. Even after the fall of the Roman state, the alphabet survived in intellectual and religious works. It eventually became used for the descendant languages of Latin (the Romance languages) and then for most of the other languages of Europe. Some adaptations of the Latin alphabet are augmented with ligatures, such as æ in Danish and Icelandic and Ȣ in Algonquian; by borrowings from other alphabets, such as the thorn þ in Old English and Icelandic, which came from the Futhark runes; and by modifying existing letters, such as the eth ð of Old English and Icelandic, which is a modified d. Other alphabets only use a subset of the Latin alphabet, such as Hawaiian, and Italian, which uses the letters j, k, x, y and w only in foreign words. Another notable script is Elder Futhark, which is believed to have evolved out of one of the Old Italic alphabets. Elder Futhark gave rise to a variety of alphabets known collectively as the Runic alphabets. The Runic alphabets were used for Germanic languages from AD 100 to the late Middle Ages. Its usage is mostly restricted to engravings on stone and jewelry, although inscriptions have also been found on bone and wood. These alphabets have since been replaced with the Latin alphabet, except for decorative usage for which the runes remained in use until the 20th century. The Old Hungarian script is a contemporary writing system of the Hungarians. It was in use during the entire history of Hungary, albeit not as an official writing system. From the 19th century it once again became more and more popular. The Glagolitic alphabet was the initial script of the liturgical language Old Church Slavonic and became, together with the Greek uncial script, the basis of the Cyrillic script. Cyrillic is one of the most widely used modern alphabetic scripts, and is notable for its use in Slavic languages and also for other languages within the former Soviet Union. Cyrillic alphabets include the Serbian, Macedonian, Bulgarian, Russian, Belarusian and Ukrainian. The Glagolitic alphabet is believed to have been created by Saints Cyril and Methodius, while the Cyrillic alphabet was invented by Clement of Ohrid, who was their disciple. They feature many letters that appear to have been borrowed from or influenced by the Greek alphabet and the Hebrew alphabet. The longest European alphabet is the Latin-derived Slovak alphabet which has 46 letters. Beyond the logographic Chinese writing, many phonetic scripts are in existence in Asia. The Arabic alphabet, Hebrew alphabet, Syriac alphabet, and other abjads of the Middle East are developments of the Aramaic alphabet, but because these writing systems are largely consonant-based they are often not considered true alphabets. Most alphabetic scripts of India and Eastern Asia are descended from the Brahmi script, which is often believed to be a descendant of Aramaic. In Korea, the Hangul alphabet was created by Sejong the Great. Hangul is a unique alphabet: it is a featural alphabet, where many of the letters are designed from a sound's place of articulation (P to look like the widened mouth, L to look like the tongue pulled in, etc. ); its design was planned by the government of the day; and it places individual letters in syllable clusters with equal dimensions, in the same way as Chinese characters, to allow for mixed-script writing (one syllable always takes up one type-space no matter how many letters get stacked into building that one sound-block). Zhuyin (sometimes called Bopomofo) is a semi-syllabary used to phonetically transcribe Mandarin Chinese in the Republic of China. After the later establishment of the People's Republic of China and its adoption of Hanyu Pinyin, the use of Zhuyin today is limited, but it is still widely used in Taiwan where the Republic of China still governs. Zhuyin developed out of a form of Chinese shorthand based on Chinese characters in the early 1900s and has elements of both an alphabet and a syllabary. Like an alphabet the phonemes of syllable initials are represented by individual symbols, but like a syllabary the phonemes of the syllable finals are not; rather, each possible final (excluding the medial glide) is represented by its own symbol. For example, luan is represented as ㄌㄨㄢ (l-u-an), where the last symbol ㄢ represents the entire final -an. While Zhuyin is not used as a mainstream writing system, it is still often used in ways similar to a romanization system—that is, for aiding in pronunciation and as an input method for Chinese characters on computers and cellphones. European alphabets, especially Latin and Cyrillic, have been adapted for many languages of Asia. Arabic is also widely used, sometimes as an abjad (as with Urdu and Persian) and sometimes as a complete alphabet (as with Kurdish and Uyghur). The term "alphabet" is used by linguists and paleographers in both a wide and a narrow sense. In the wider sense, an alphabet is a script that is segmental at the phoneme level—that is, it has separate glyphs for individual sounds and not for larger units such as syllables or words. In the narrower sense, some scholars distinguish "true" alphabets from two other types of segmental script, abjads and abugidas. These three differ from each other in the way they treat vowels: abjads have letters for consonants and leave most vowels unexpressed; abugidas are also consonant-based, but indicate vowels with diacritics to or a systematic graphic modification of the consonants. In alphabets in the narrow sense, on the other hand, consonants and vowels are written as independent letters. The earliest known alphabet in the wider sense is the Wadi el-Hol script, believed to be an abjad, which through its successor Phoenician is the ancestor of modern alphabets, including Arabic, Greek, Latin (via the Old Italic alphabet), Cyrillic (via the Greek alphabet) and Hebrew (via Aramaic). All three types may be augmented with syllabic glyphs. Ugaritic, for example, is basically an abjad, but has syllabic letters for /ʔa, ʔi, ʔu/. (These are the only time vowels are indicated.) Cyrillic is basically a true alphabet, but has syllabic letters for /ja, je, ju/ (я, е, ю); Coptic has a letter for /ti/. Devanagari is typically an abugida augmented with dedicated letters for initial vowels, though some traditions use अ as a zero consonant as the graphic base for such vowels. Thus the primary classification of alphabets reflects how they treat vowels. For tonal languages, further classification can be based on their treatment of tone, though names do not yet exist to distinguish the various types. Some alphabets disregard tone entirely, especially when it does not carry a heavy functional load, as in Somali and many other languages of Africa and the Americas. Such scripts are to tone what abjads are to vowels. Most commonly, tones are indicated with diacritics, the way vowels are treated in abugidas. This is the case for Vietnamese (a true alphabet) and Thai (an abugida). In Thai, tone is determined primarily by the choice of consonant, with diacritics for disambiguation. In the Pollard script, an abugida, vowels are indicated by diacritics, but the placement of the diacritic relative to the consonant is modified to indicate the tone. More rarely, a script may have separate letters for tones, as is the case for Hmong and Zhuang. For most of these scripts, regardless of whether letters or diacritics are used, the most common tone is not marked, just as the most common vowel is not marked in Indic abugidas; in Zhuyin not only is one of the tones unmarked, but there is a diacritic to indicate lack of tone, like the virama of Indic. The number of letters in an alphabet can be quite small. The Book Pahlavi script, an abjad, had only twelve letters at one point, and may have had even fewer later on. Today the Rotokas alphabet has only twelve letters. (The Hawaiian alphabet is sometimes claimed to be as small, but it actually consists of 18 letters, including the ʻokina and five long vowels. However, Hawaiian Braille has only 13 letters.) While Rotokas has a small alphabet because it has few phonemes to represent (just eleven), Book Pahlavi was small because many letters had been conflated—that is, the graphic distinctions had been lost over time, and diacritics were not developed to compensate for this as they were in Arabic, another script that lost many of its distinct letter shapes. For example, a comma-shaped letter represented g, d, y, k, or j. However, such apparent simplifications can perversely make a script more complicated. In later Pahlavi papyri, up to half of the remaining graphic distinctions of these twelve letters were lost, and the script could no longer be read as a sequence of letters at all, but instead each word had to be learned as a whole—that is, they had become logograms as in Egyptian Demotic. The largest segmental script is probably an abugida, Devanagari. When written in Devanagari, Vedic Sanskrit has an alphabet of 53 letters, including the visarga mark for final aspiration and special letters for kš and jñ, though one of the letters is theoretical and not actually used. The Hindi alphabet must represent both Sanskrit and modern vocabulary, and so has been expanded to 58 with the khutma letters (letters with a dot added) to represent sounds from Persian and English. Thai has a total of 59 symbols, consisting of 44 consonants, 13 vowels and 2 syllabics, not including 4 diacritics for tone marks and one for vowel length. The largest known abjad is Sindhi, with 51 letters. The largest alphabets in the narrow sense include Kabardian and Abkhaz (for Cyrillic), with 58 and 56 letters, respectively, and Slovak (for the Latin script), with 46. However, these scripts either count di- and tri-graphs as separate letters, as Spanish did with ch and ll until recently, or uses diacritics like Slovak č. The Georgian alphabet (Georgian: ანბანი Anbani) is an alphabetic writing system. With 33 letters, it is the largest true alphabet where each letter is graphically independent. The original Georgian alphabet had 38 letters but 5 letters were removed in 19th century by Ilia Chavchavadze. The Georgian alphabet is much closer to Greek than the other Caucasian alphabets. The letter order parallels the Greek, with the consonants without a Greek equivalent organized at the end of the alphabet. The origins of the alphabet are still unknown. Some Armenian and Western scholars believe it was created by Mesrop Mashtots (Armenian: Մեսրոպ Մաշտոց Mesrop Maštoc') also known as Mesrob the Vartabed, who was an early medieval Armenian linguist, theologian, statesman and hymnologist, best known for inventing the Armenian alphabet c. 405 AD; other Georgian and Western scholars are against this theory. Syllabaries typically contain 50 to 400 glyphs, and the glyphs of logographic systems typically number from the many hundreds into the thousands. Thus a simple count of the number of distinct symbols is an important clue to the nature of an unknown script. The Armenian alphabet (Armenian: Հայոց գրեր Hayots grer or Հայոց այբուբեն Hayots aybuben) is a graphically unique alphabetical writing system that has been used to write the Armenian language. It was introduced by Mesrob Mashdots around 405 AD, an Armenian linguist and ecclesiastical leader, and originally contained 36 letters. Two more letters, օ (o) and ֆ (f), were added in the Middle Ages. During the 1920s orthography reform, a new letter և (capital ԵՎ) was added, which was a ligature before ե+ւ, while the letter Ւ ւ was discarded and reintroduced as part of a new letter ՈՒ ու (which was a digraph before). The Armenian word for "alphabet" is այբուբեն aybuben (Armenian pronunciation: [ɑjbubɛn]), named after the first two letters of the Armenian alphabet Ա այբ ayb and Բ բեն ben. The Armenian script's directionality is horizontal left-to-right, like the Latin and Greek alphabets. Alphabets often come to be associated with a standard ordering of their letters, which can then be used for purposes of collation—namely for the listing of words and other items in what is called alphabetical order. The basic ordering of the Latin alphabet (A B C D E F G H I J K L M N O P Q R S T U V W X Y Z), which is derived from the Northwest Semitic "Abgad" order, is well established, although languages using this alphabet have different conventions for their treatment of modified letters (such as the French é, à, and ô) and of certain combinations of letters (multigraphs). In French, these are not considered to be additional letters for the purposes of collation. However, in Icelandic, the accented letters such as á, í, and ö are considered distinct letters representing different vowel sounds from the sounds represented by their unaccented counterparts. In Spanish, ñ is considered a separate letter, but accented vowels such as á and é are not. The ll and ch were also considered single letters, but in 1994 the Real Academia Española changed the collating order so that ll is between lk and lm in the dictionary and ch is between cg and ci, and in 2010 the tenth congress of the Association of Spanish Language Academies changed it so they were no longer letters at all. In German, words starting with sch- (which spells the German phoneme /ʃ/) are inserted between words with initial sca- and sci- (all incidentally loanwords) instead of appearing after initial sz, as though it were a single letter—in contrast to several languages such as Albanian, in which dh-, ë-, gj-, ll-, rr-, th-, xh- and zh- (all representing phonemes and considered separate single letters) would follow the letters d, e, g, l, n, r, t, x and z respectively, as well as Hungarian and Welsh. Further, German words with umlaut are collated ignoring the umlaut—contrary to Turkish that adopted the graphemes ö and ü, and where a word like tüfek, would come after tuz, in the dictionary. An exception is the German telephone directory where umlauts are sorted like ä = ae since names such as Jäger also appear with the spelling Jaeger, and are not distinguished in the spoken language. The Danish and Norwegian alphabets end with æ—ø—å, whereas the Swedish and Finnish ones conventionally put å—ä—ö at the end. It is unknown whether the earliest alphabets had a defined sequence. Some alphabets today, such as the Hanuno'o script, are learned one letter at a time, in no particular order, and are not used for collation where a definite order is required. However, a dozen Ugaritic tablets from the fourteenth century BC preserve the alphabet in two sequences. One, the ABCDE order later used in Phoenician, has continued with minor changes in Hebrew, Greek, Armenian, Gothic, Cyrillic, and Latin; the other, HMĦLQ, was used in southern Arabia and is preserved today in Ethiopic. Both orders have therefore been stable for at least 3000 years. Runic used an unrelated Futhark sequence, which was later simplified. Arabic uses its own sequence, although Arabic retains the traditional abjadi order for numbering. The Brahmic family of alphabets used in India use a unique order based on phonology: The letters are arranged according to how and where they are produced in the mouth. This organization is used in Southeast Asia, Tibet, Korean hangul, and even Japanese kana, which is not an alphabet. The Phoenician letter names, in which each letter was associated with a word that begins with that sound (acrophony), continue to be used to varying degrees in Samaritan, Aramaic, Syriac, Hebrew, Greek and Arabic. The names were abandoned in Latin, which instead referred to the letters by adding a vowel (usually e) before or after the consonant; the two exceptions were Y and Z, which were borrowed from the Greek alphabet rather than Etruscan, and were known as Y Graeca "Greek Y" (pronounced I Graeca "Greek I") and zeta (from Greek)—this discrepancy was inherited by many European languages, as in the term zed for Z in all forms of English other than American English. Over time names sometimes shifted or were added, as in double U for W ("double V" in French), the English name for Y, and American zee for Z. Comparing names in English and French gives a clear reflection of the Great Vowel Shift: A, B, C and D are pronounced /eɪ, biː, siː, diː/ in today's English, but in contemporary French they are /a, be, se, de/. The French names (from which the English names are derived) preserve the qualities of the English vowels from before the Great Vowel Shift. By contrast, the names of F, L, M, N and S (/ɛf, ɛl, ɛm, ɛn, ɛs/) remain the same in both languages, because "short" vowels were largely unaffected by the Shift. In Cyrillic originally the letters were given names based on Slavic words; this was later abandoned as well in favor of a system similar to that used in Latin. When an alphabet is adopted or developed to represent a given language, an orthography generally comes into being, providing rules for the spelling of words in that language. In accordance with the principle on which alphabets are based, these rules will generally map letters of the alphabet to the phonemes (significant sounds) of the spoken language. In a perfectly phonemic orthography there would be a consistent one-to-one correspondence between the letters and the phonemes, so that a writer could predict the spelling of a word given its pronunciation, and a speaker would always know the pronunciation of a word given its spelling, and vice versa. However this ideal is not usually achieved in practice; some languages (such as Spanish and Finnish) come close to it, while others (such as English) deviate from it to a much larger degree. 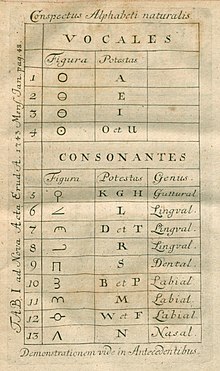 The pronunciation of a language often evolves independently of its writing system, and writing systems have been borrowed for languages they were not designed for, so the degree to which letters of an alphabet correspond to phonemes of a language varies greatly from one language to another and even within a single language. A language may represent a given phoneme by a combination of letters rather than just a single letter. Two-letter combinations are called digraphs and three-letter groups are called trigraphs. German uses the tetragraphs (four letters) "tsch" for the phoneme [tʃ] and (in a few borrowed words) "dsch" for [dʒ]. 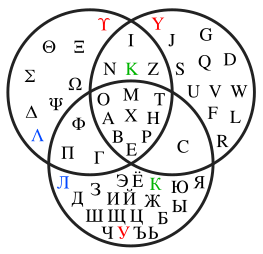 Kabardian also uses a tetragraph for one of its phonemes, namely "кхъу". Two letters representing one sound occur in several instances in Hungarian as well (where, for instance, cs stands for [tʃ], sz for [s], zs for [ʒ], dzs for [dʒ]). A language may represent the same phoneme with two or more different letters or combinations of letters. An example is modern Greek which may write the phoneme [i] in six different ways: ⟨ι⟩, ⟨η⟩, ⟨υ⟩, ⟨ει⟩, ⟨οι⟩, and ⟨υι⟩ (though the last is rare). A language may spell some words with unpronounced letters that exist for historical or other reasons. For example, the spelling of the Thai word for "beer" [เบียร์] retains a letter for the final consonant "r" present in the English word it was borrowed from, but silences it. Pronunciation of individual words may change according to the presence of surrounding words in a sentence (sandhi). Different dialects of a language may use different phonemes for the same word. A language may use different sets of symbols or different rules for distinct sets of vocabulary items, such as the Japanese hiragana and katakana syllabaries, or the various rules in English for spelling words from Latin and Greek, or the original Germanic vocabulary. National languages sometimes elect to address the problem of dialects by simply associating the alphabet with the national standard. Some national languages like Finnish, Turkish, Russian, Serbo-Croatian (Serbian, Croatian and Bosnian) and Bulgarian have a very regular spelling system with a nearly one-to-one correspondence between letters and phonemes. Strictly speaking, these national languages lack a word corresponding to the verb "to spell" (meaning to split a word into its letters), the closest match being a verb meaning to split a word into its syllables. Similarly, the Italian verb corresponding to 'spell (out)', compitare, is unknown to many Italians because spelling is usually trivial, as Italian spelling is highly phonemic. In standard Spanish, one can tell the pronunciation of a word from its spelling, but not vice versa, as certain phonemes can be represented in more than one way, but a given letter is consistently pronounced. French, with its silent letters and its heavy use of nasal vowels and elision, may seem to lack much correspondence between spelling and pronunciation, but its rules on pronunciation, though complex, are actually consistent and predictable with a fair degree of accuracy. At the other extreme are languages such as English, where the pronunciations of many words simply have to be memorized as they do not correspond to the spelling in a consistent way. For English, this is partly because the Great Vowel Shift occurred after the orthography was established, and because English has acquired a large number of loanwords at different times, retaining their original spelling at varying levels. Even English has general, albeit complex, rules that predict pronunciation from spelling, and these rules are successful most of the time; rules to predict spelling from the pronunciation have a higher failure rate. Sometimes, countries have the written language undergo a spelling reform to realign the writing with the contemporary spoken language. These can range from simple spelling changes and word forms to switching the entire writing system itself, as when Turkey switched from the Arabic alphabet to a Latin-based Turkish alphabet. The standard system of symbols used by linguists to represent sounds in any language, independently of orthography, is called the International Phonetic Alphabet. ^ Coulmas, Florian (1996). The Blackwell Encyclopedia of Writing Systems. Oxford: Blackwell Publishing. ISBN 978-0-631-21481-6. ^ "What Language Has the Largest Alphabet?". 2014-12-26. Languages like Chinese, technically, do not use an alphabet but have an ideographic writing system. There are thousands of symbols (pictographs) in Chinese representing different words, syllables and concepts. [..] The language with the most letters is Khmer (Cambodian), with 74 (including some without any current use). According to Guinness Book of World Records, 1995, the Khmer alphabet is the largest alphabet in the world. It consists of 33 consonants, 23 vowels and 12 independent vowels. ^ Lynn, Bernadette (2004-04-08). "The Development of the Western Alphabet". h2g2. BBC. Retrieved 2008-08-04. ^ Darnell, J. C.; Dobbs-Allsopp, F. W.; Lundberg, Marilyn J.; McCarter, P. Kyle; Zuckerman, Bruce; Manassa, Colleen (2005). "Two Early Alphabetic Inscriptions from the Wadi el-Ḥôl: New Evidence for the Origin of the Alphabet from the Western Desert of Egypt". The Annual of the American Schools of Oriental Research. 59: 63, 65, 67–71, 73–113, 115–124. JSTOR 3768583. ^ "上親制諺文二十八字…是謂訓民正音(His majesty created 28 characters himself... It is Hunminjeongeum (original name for Hangul))", 《세종실록 (The Annals of the Choson Dynasty : Sejong)》 25년 12월. ^ Kuiwon (October 16, 2013). "On Hangul Supremacy & Exclusivity—Mixed Script Predates the Japanese Colonial Period". kuiwon.wordpress.com. ^ Rayfield, Donald (2013). The Literature of Georgia: A History. Caucasus World. Routledge. p. 19. ISBN 978-0-7007-1163-5. The Georgian alphabet seems unlikely to have a pre-Christian origin, for the major archaeological monument of the first century first century AD, the bilingual Armazi gravestone commemorating Serafita, daughter of the Georgian viceroy of Mtskheta, is inscribed in Greek and Aramaic only. 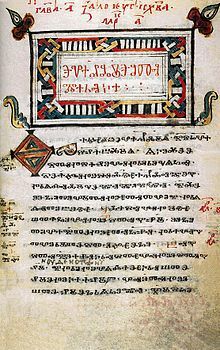 It has been believed, and not only in Armenia, that all the Caucasian alphabets—Armenian, Georgian and Caucaso-Albanian—were invented in the fourth century by the Armenian scholar Mesrop Mashtots.... The Georgian chronicles The Life of Kartli (ქართლის ცხოვრება) assert that a Georgian script was invented two centuries before Christ, an assertion unsupported by archaeology. There is a possibility that the Georgians, like many minor nations of the area, wrote in a foreign language—Persian, Aramaic, or Greek—and translated back as they read. ^ Glen Warren Bowersock, Peter Robert Lamont Brown, Oleg Grabar. Late Antiquity: A Guide to the Postclassical World. Harvard University Press, 1999. ISBN 0-674-51173-5. p. 289. James R. Russell. Alphabets. "Mastoc' was a charismatic visionary who accomplished his task at a time when Armenia stood in danger of losing both its national identity, through partition, and its newly acquired Christian faith, through Sassanian pressure and reversion to paganism. By preaching in Armenian, he was able to undermine and co-opt the discourse founded in native tradition, and to create a counterweight against both Byzantine and Syriac cultural hegemony in the church. Mastoc' also created the Georgian and Caucasian-Albanian alphabets, based on the Armenian model." ^ Seibt, Werner. "The Creation of the Caucasian Alphabets as Phenomenon of Cultural History". ^ Ager, Simon (2010). "Armenian alphabet". Omniglot. Archived from the original on 2 January 2010. Retrieved 2010-01-02. Coulmas, Florian (1989). The Writing Systems of the World. Blackwell Publishers Ltd. ISBN 978-0-631-18028-9. Daniels, Peter T.; Bright, William (1996). The World's Writing Systems. Oxford University Press. ISBN 978-0-19-507993-7. Overview of modern and some ancient writing systems. Driver, G. R. (1976). Semitic Writing (Schweich Lectures on Biblical Archaeology S.) 3Rev Ed. Oxford University Press. ISBN 978-0-19-725917-7. Haarmann, Harald (2004). Geschichte der Schrift [History of Writing] (in German) (2nd ed.). München: C. H. Beck. ISBN 978-3-406-47998-4. Hoffman, Joel M. (2004). In the Beginning: A Short History of the Hebrew Language. NYU Press. ISBN 978-0-8147-3654-8. Chapter 3 traces and summarizes the invention of alphabetic writing. Logan, Robert K. (2004). The Alphabet Effect: A Media Ecology Understanding of the Making of Western Civilization. Hampton Press. ISBN 978-1-57273-523-1. McLuhan, Marshall; Logan, Robert K. (1977). "Alphabet, Mother of Invention". ETC: A Review of General Semantics. 34 (4): 373–383. JSTOR 42575278. Millard, A. R. (1986). "The Infancy of the Alphabet". World Archaeology. 17 (3): 390–398. doi:10.1080/00438243.1986.9979978. JSTOR 124703. Ouaknin, Marc-Alain; Bacon, Josephine (1999). Mysteries of the Alphabet: The Origins of Writing. Abbeville Press. ISBN 978-0-7892-0521-6. Powell, Barry (1991). Homer and the Origin of the Greek Alphabet. Cambridge University Press. ISBN 978-0-521-58907-9. Powell, Barry B. (2009). Writing: Theory and History of the Technology of Civilization. Oxford: Blackwell. ISBN 978-1-4051-6256-2. Sacks, David (2004). Letter Perfect: The Marvelous History of Our Alphabet from A to Z (PDF). Broadway Books. ISBN 978-0-7679-1173-3. Look up alphabet in Wiktionary, the free dictionary. Wikimedia Commons has media related to Alphabets.